My green tea chocolate obsession started when my former boss made me take that first bite of Green Tea Kit Kat. It’s too bad she got me hooked with just one taste, because these are only available in Japan and Hong Kong. I actually found some a few months ago in a Japanese restaurant in BF, but a small pack there costs 300Pesos, which is beyond ridiculous if you ask me. Still, I’d been thinking about the stuff so much that I almost gave in to that expensive pack of green tea goodness. Luckily, my better judgement prevailed. Fast forward to a few weeks ago, and you can imagine my excitement when I discovered that Royce had just opened in Town Center. Finally, green tea chocolate within walking distance from home! I excitedly rushed to the counter and asked the guy for a box of Macha Nama Chocolates. My heart broke when he told me that they didn’t have any in stock yet, but he said I should come back in a few days. Weeks passed and every attempt I have made since then to get that one box of green tea chocolates turned out to be failure after disappointing failure. Tonight, I was greeted by a pleasant surprise – Mr. C came home with a box of Macha Nama Chocolates just for me! I finally got my fix of the melt in your mouth green tea chocolate goodness I had long been craving for. I’ve said it before and I’ll say it again, I really am lucky to have a husband who tolerates my snooty food preferences. 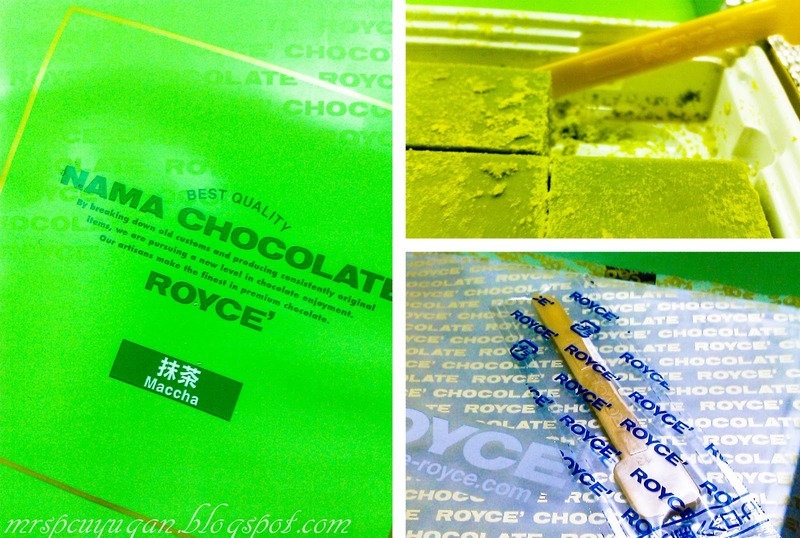 If you haven’t tried Royce chocolates yet, I suggest you get your hands on some real soon. These Japanese confections are just too yummy for words. Apart from the Macha, the Champagne Nama Chocolates are to die for as well. You should also try their the chocolate covered potato chips. So addicting! And yes, all this drama over chocolate. That’s me! hi there 🙂 yes try their chocolates then let me know what you think!